Standing to Sue for Iowa Nursing Home Abuse and Negligence | Hupy and Abraham, S.C.
Do I have the right to bring a lawsuit alleging nursing home abuse or negligence in Iowa? An Iowa nursing home abuse lawyer can file a complaint only on behalf of a client. The nursing home abuse attorney does not have the ability to file an independent complaint. Instead, someone with the legal standing to sue must bring the case against the nursing home, nursing home staff member, or other responsible party. Of course, the person with standing to sue has the right to work with an experienced attorney who can make sure that all of her rights are protected, who can fight hard for her fair recovery, and who can take the stress of litigation off of her shoulders. You are the one who suffered injuries because of the abuse or negligence. If you are the one who was hurt then it is your right to seek damages on your own behalf. You are the legal guardian of the person who suffered abuse or negligence. If this is the case then you are seeking damages on behalf of the person for whom you are the guardian. You are the personal representative of the estate of someone who suffered abuse or negligence prior to death. In this type of complaint, you are seeking damages on behalf of the estate for the injuries that the nursing home resident suffered. If you do not have standing to sue and you file a complaint in state court, then you can expect the defendant to motion the court to dismiss your case and you can expect that motion to be granted. 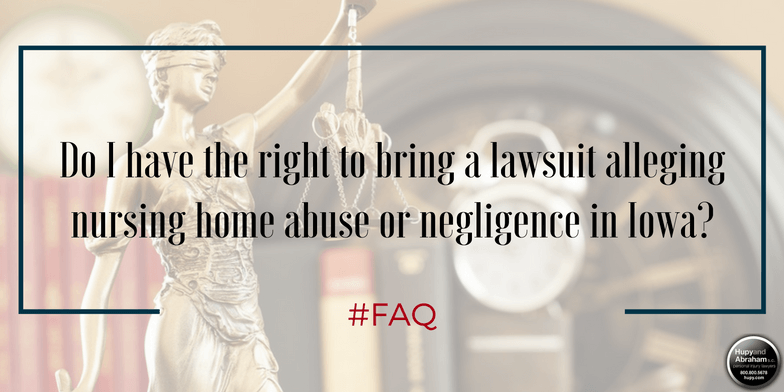 Nursing homes typically fight back hard against allegations of abuse or neglect, and you have to fight just as hard to make sure that your case is heard and that you recover the fair damages to which you are legally entitled.